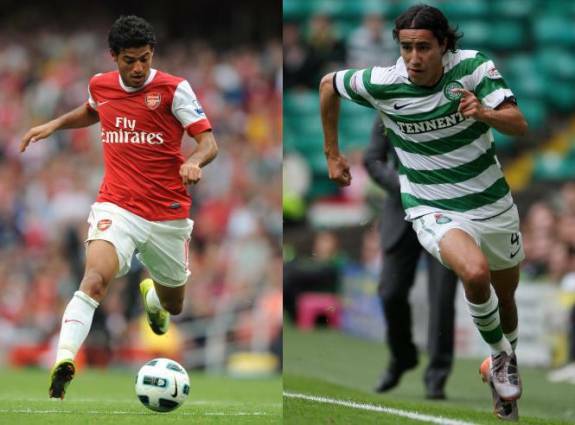 Arsenal striker Carlos Vela and Celtic midfielder Efrain Juarez have both been handed a six-month international ban by the Mexican Football Federation (FMF) and been fined £2500 each for their part in a ‘raucous party’ that was held at the team hotel after El Tri beat Colombia earlier this month. The FMF saw fit to charge the pair with ‘breaching the Federation’s rules of conduct’ and, as a result, neither Vela nor Juarez will be available for selection until March of next year. i think that is not fair cauz they were out of concentration and they were not representing mexico no more n i mean there humans they dont have the privelage to pary alot “well they still do” hahah anyways it wuz good that the money went to the people from veracruz taht was the good part.